Beauty absorbed in her latest good read at Eseltjiesrus. Booklovers from everywhere are invited to celebrate the pleasure of reading at the 2019 Eseltjiesrus Book Fair in McGregor. Diarise 17 – 19 May 2019 and make sure you are part of the reading action! 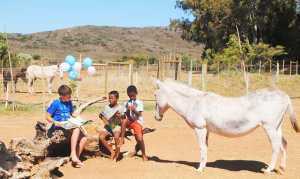 The Eseltjiesrus Donkey Sanctuary highlights 15 years of promoting a culture of reading at their annual Eseltjiesrus Book Fair. This is an event for booklovers, bargain hunters and those readers looking for special treasures. The Storytelling and Book reading Theatre for children at the Book Fair, was introduced last year to make sure that no one visiting the event is deprived of the joy of reading a good book. Tables will once again groan under the weight of thousands of new and pre-owned books on a variety of topics at rock-bottom prices. Whether you are looking for non-fiction, the latest novels, books on travel, poetry, self-help, cookery, children’s or Afrikaans books, you will find new stock will be put out every day. 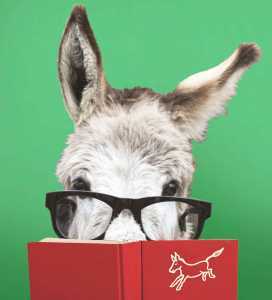 Every book purchased will aid donkeys in need. Eseltjiesrus Donkey Sanctuary provides a permanent refuge for abused, neglected and elderly donkeys just outside McGregor. Here they are given the opportunity to live out their lives with dignity in a natural environment. Each donkey is cared for and checked daily according to their individual needs. The Sanctuary is open to the public four days a week to give both adults and children the opportunity to interact with the donkeys on guided tours. Part of the work of the Sanctuary that is growing steadily is to deal with queries from across the country regarding good donkey care. Most problems arise from ignorance. Help given in this way contributes to raising the status of donkeys, and each individual animal that is helped is one less in pain or discomfort. The local community also benefits from the event.